Since the legalisation of off-course cash betting in 1960, and the rise of varying forms of gambling, the British have come to be known as a nation of gamblers. Until this study was published in 1976, barely any evidence existed against which to assess the claim that gambling has become a major social problem. 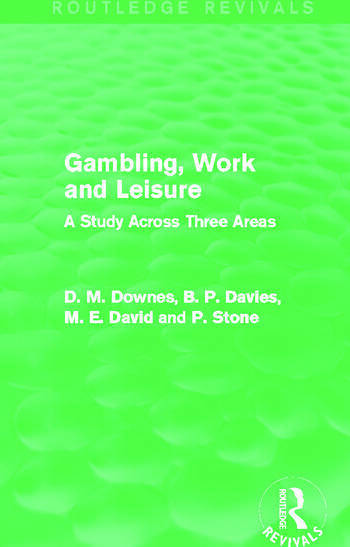 The authors present data drawn from area surveys carried out in Swansea, Sheffield, Wanstead and Woodford, and explore how well previous sociological theories of gambling agree with their findings, particular in connection with certain aspects of work and leisure. Examining different forms of gambling, including betting, bingo and slot machines, the chapters consider how gambling choices vary between different social groups, and how much time and money is spent on them. With the internet making it easier than ever before top place bets, this title is especially relevant, and provides a systematic basis for an explanation of gambling in relation to social structure.